Even if it’s just one pair or 50 pairs of shoes, it’s inevitable that shoes can cause clutter. Though shoes are everybody’s best friend it would be nice to see them all piled up in one storage space or rack, agree with me? Yes! You can easily go to any department store and buy one right away but wouldn’t be expensive for just a few pairs of shoes? What if you have plenty of extra pallet woods that has been used but still recyclable? 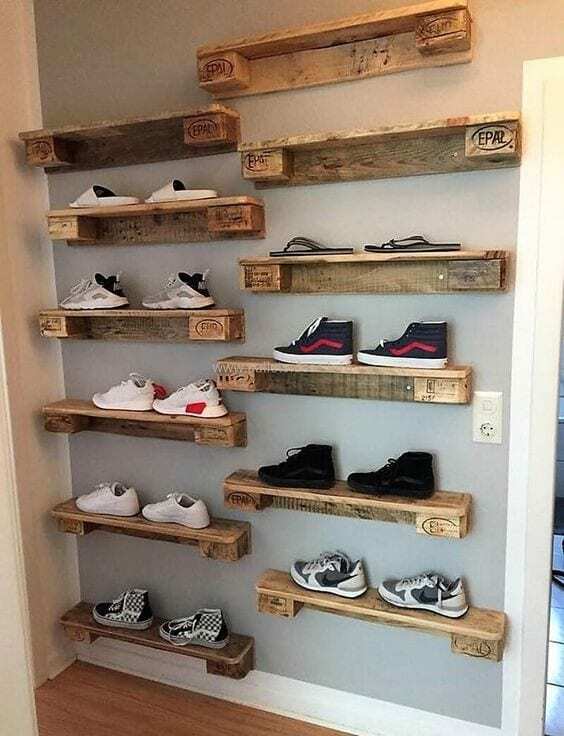 Pallet shoe racks are not just easy to use, it’s also an attractive way to put your shoes in one place. 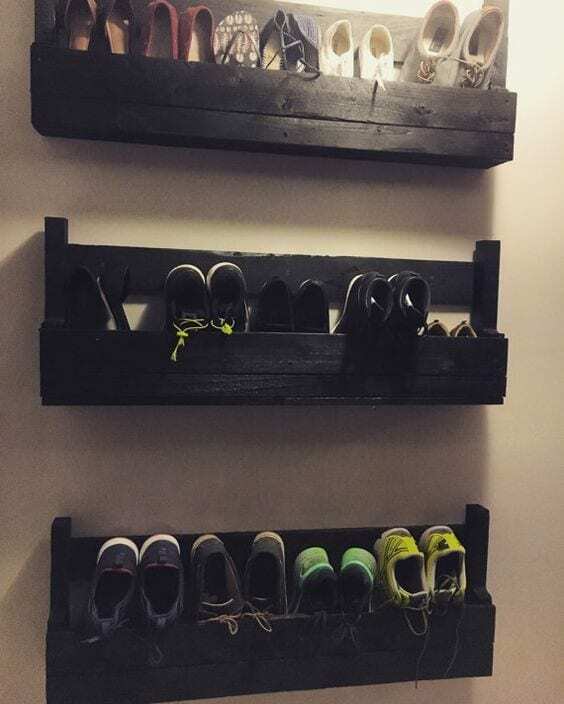 Spare a few minutes and take a look at these DIY pallet shoe rack. 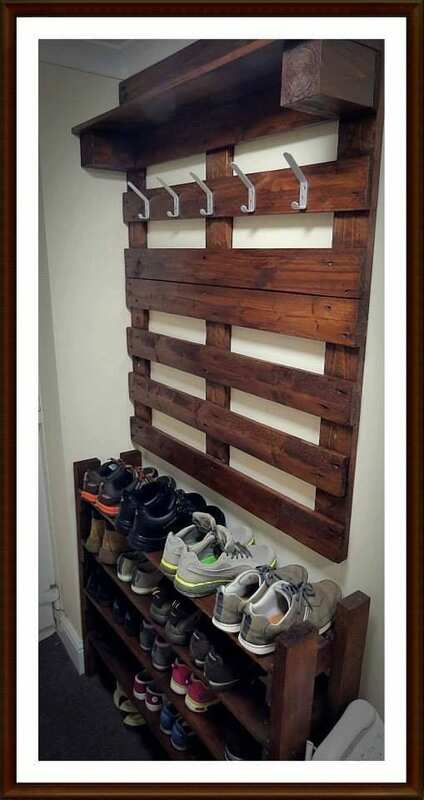 You’d have a vast variety of choices in making your own pallet wood shoe rack since anything can be made with a pallet wood. This may end your misery of cluttered shoes and even give you an artistic and stylish furniture for shoes. A multi-purpose shoe organizer and table all at the same time. If you have plenty of extra pallet woods with a size as seen in the picture, then you can make this shoe rack. The capacity is moderate, you can have this shoe rack if you only have less than 10 pairs, but if you have a truck of shoes ironically then you’ll need a larger shoe rack. You can create this within a day if you have the complete materials and equipment that will help you build then it would be very convenient. This shoe rack maintained consistency as to the interior of the house. As what you can notice in the photo, the pallet wood shoe rack has the same design from the hanging organizer cabinet above. It has the same paint color, the same wood design and they have the same purpose as well, both of these pallet wood furniture are organizers. 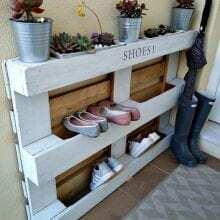 You can easily build this but with the help of a wood expert, you can add curves and borders to the wood hanged and to the shoe rack. If you’d want all organizers at one corner in your house, you can have this hallway hanger + shoe rack. It’s convenient since you’ll only go to one place or corner when removing shoes, jackets, and hats. The pallet wood for this furniture is furnished making it look a little rustic. This could be placed on either your hallway or just beside your doorstep to make it more accessible. It’s also a little bulky and inconvenient to see a huge cabinet full of shoes beside your doorstep or at any corner of your house, right? Let’s try and hang them, shall we? 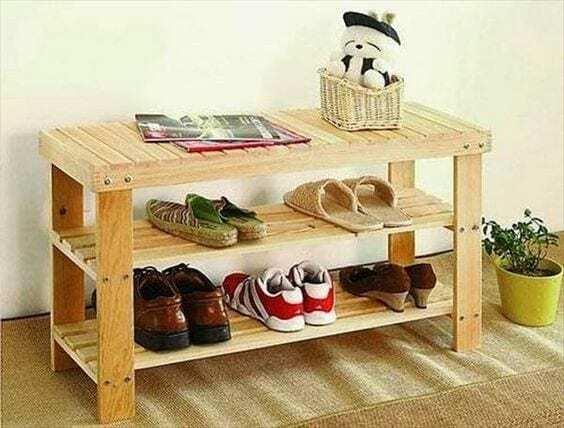 This pallet wood shoe rack is another idea that can save the clutters and unorganized shoes of people around the house. Instead of putting it on the ground, you can hang it at eye level. This will make your shoe picking more easy and convenient because you won’t need to lean down and look for your stilettos. If you’re a minimalist and every space is essential, this is an ideal pallet shoe organizer for you. We all know every corner of the house, literally, every corner of the house can’t be used up completely. You can maybe put up a cabinet but you won’t be able to consume the corners. 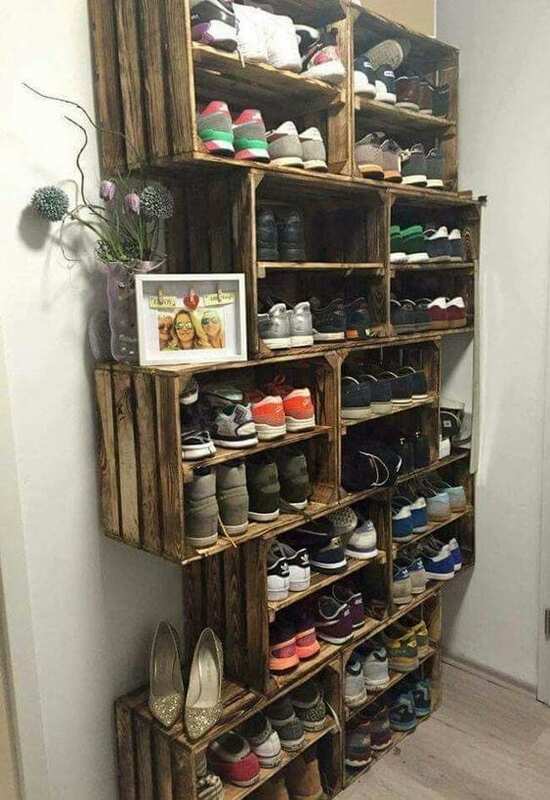 This pallet wood shoe rack uses less pallet wood, less space and fewer shoes only. Ideally, you can put less than 5 pairs of shoes for this shoe rack. If your artistic and all you’ve wanted is a colorful hue for all your furniture, then you’d probably want this colorful hanging shoe rack. It’s plain, simple and convenient. You won’t have to look at your shoes hideously stacked on each other. This shoe rack makes it more clean and stylish all at the same time. You can put up this shoe rock with a few pallet kinds of wood, colorful paint and your time. Place this outside your doorstep to put up a vibrant furniture outside. This shoe organizer is ideal for tiny shoes owned by our little ones. Since it has a hexagon shape space inside can only store little-sized shoes. You can make this using pallet woods as well but you’ll need more spare time to assemble it, however, this would be a stylish furniture that you can put on a corner in your house. 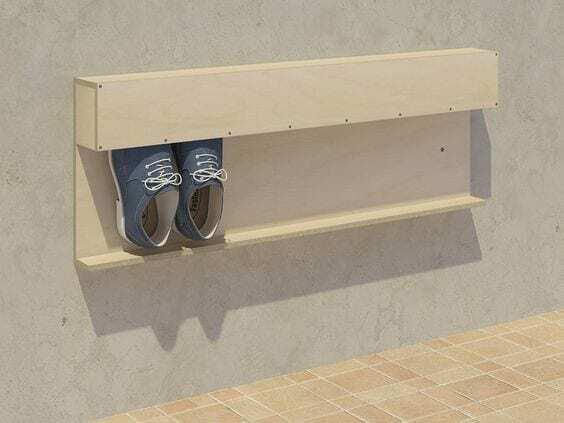 If you only have four pieces of pallet wood and you’d really want to create a shoe rack even if it’s just for a few pairs of shoes, you can make this simple shoe rack. This rack would be saving plenty of space and time. You can put this up in just a few hours or a day, and this shoe rack can probably cater not more than five pairs of shoes. 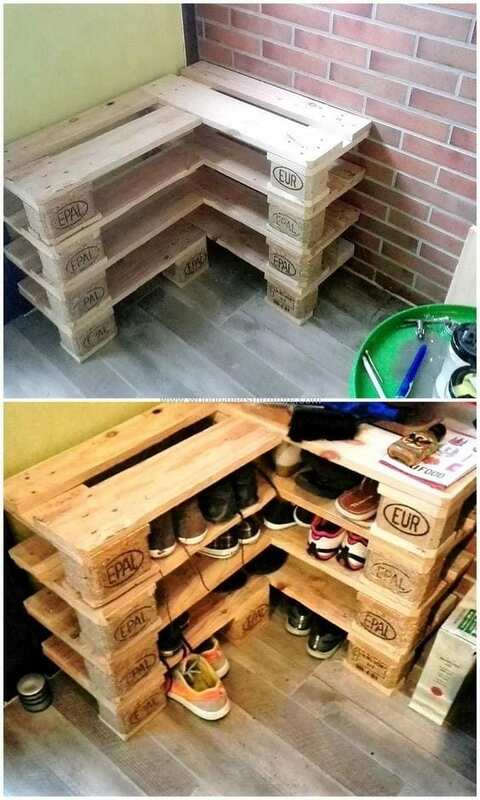 With just a few pallet kinds of wood, you can have a shoe rack! This shoe rack is best for the whole family, or if you are a shoe collector this one’s for you. A well-divided portion of the rack is best if you have a ton of shoes. You can place and organize your shoes to whatever division you’ll like. This shoe rack consumes plenty of space that’s why it’s ideal to place it inside you’re your room or in your closet. I know you hate clutters but if you’d want to keep your shoes why not keep them at an open organizer where they can be visible and it would be like showing your personal collection of shoes. This shoe rack is ideal for not more than six pairs of shoes. It’s simple to create and use for you. This shoe rack would be ideal besides your doorstep. It can cater to more than 10 pairs of shoes. You can make this through used pallet woods and it’s your option if you want to pain it or put a little stylish design to it. However, even if it’s as plain as this shoe rack in the picture it would still be useful. If all you can think about pallet wood is plain wood, then that’s where you’re making a mistake. 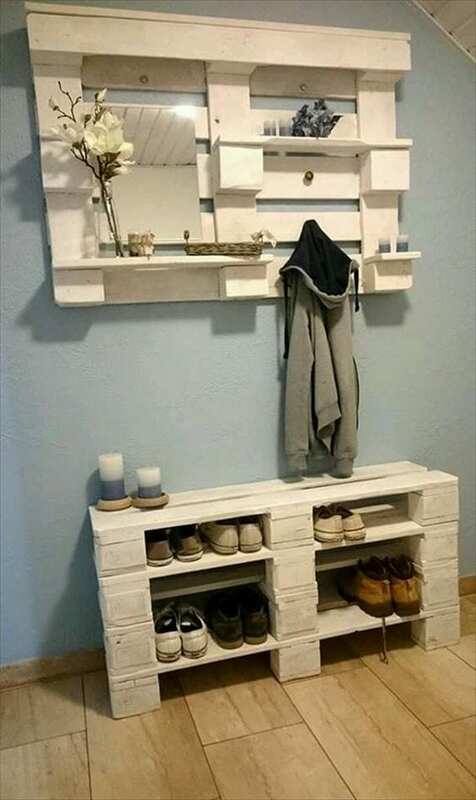 Look at this shoe organizer in the picture, it’s all made with pallet wood but it’s making a statement. It’s fashionably been installed to create a space for shoes to be shown and not just to be kept. This shoe organizer makes your house look like an expensive shoe boutique. 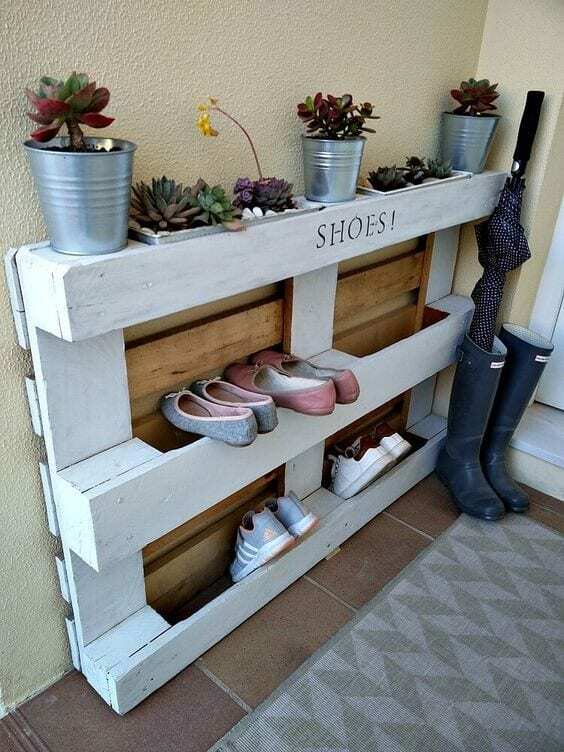 It’s very convenient to make, all you need is a few pallet kinds of wood, you can soften the pallet wood through sanding them or you can leave the pure texture of wood as what it is and you can still make a shoe organizer. A shoe organizer with flowers above it is wonderful. Isn’t it? This shoe rack is ideal to be placed outside because of the flowers on top. However, you can still place anything above it not just plants. You can either put your bag or books above it to make it more stylish and convenient all at the same time. 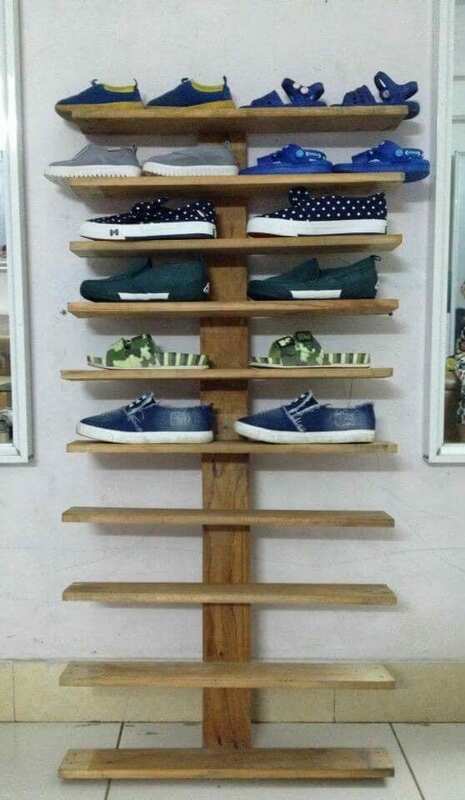 This shoe rack is built with multiple functions, as what you can see on the photo it has a chair formed with a shoe rack underneath. It can cater not more than five pairs of shoes which is great if you are saving space. A chair with a shoe rack underneath is another way to minimize the clutter from shoes. This picture shows a shoe rack, a chair, and a jacket hanger all placed in one spot inside your house. Wouldn’t this be very convenient, less of your unwanted furniture and more clutter-free space? This divider is made from an old divider as seen on the top picture. You don’t need to dismantle everything to create a shoe rack you desire. You can recycle an old divider and turn it into a new looking shoe rack. You’ll probably need a sander, an enamel paint to let the wood soften giving it a more appealing and new look. 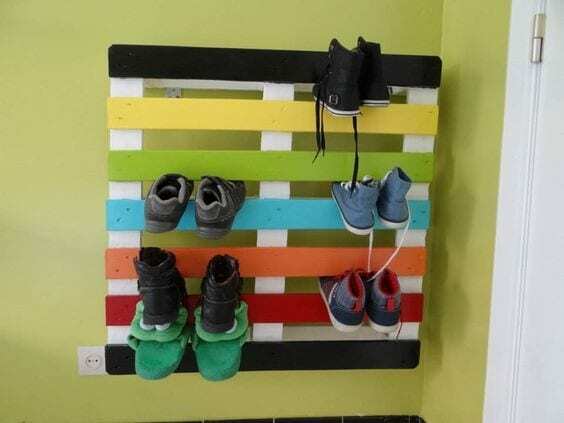 You’re probably having a brainstorm activity on how to achieve one of these pallet wood shoe rack ideas. Don’t stress yourself too much, all of this ideas are as simple as doing the laundry or cooking your best recipe. When you plan to make your own shoe rack make sure to look for the idea that you think would fit perfectly and would match your house. Don’t forget to put a little style and your own perspective to the furniture you’ll soon be making. 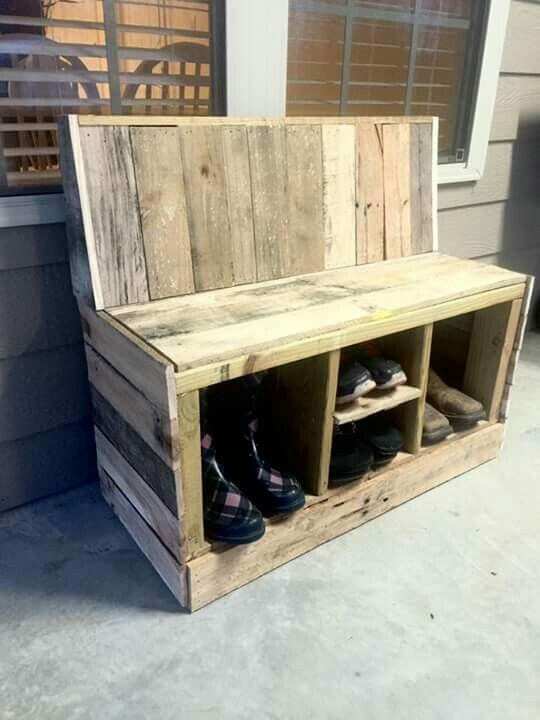 Let’s start rummaging the storage room for a few recyclable pallet kinds of wood and let’s make your pallet wood shoe rack.